Below is a list of land trusts and local governmental organizations that are certified by the State of Colorado to hold donated conservation easements. If you are thinking about donating a conservation easement on your land, you must work with one of these organizations that is qualified for conservation easement state income tax credits. If you would like help identifying the organization that is the best match for you, please call us and we will gladly point you in the right direction. Download a PDF of this list. The program conserves natural, cultural and agricultural resources and provides public use that reflects sound resource management and community values. The oldest land trust in Colorado, AVLT is a non-profit organization whose mission is to permanently preserve open lands and water for agriculture, wildlife, scenic enjoyment and recreation in the greater Roaring Fork and Colorado River Valleys. Black Canyon Regional Land Trust serves as a non-profit, non-political organization that encourages and assists private landowners in preserving the open lands, working farms and ranches, and critical natural and cultural resources of southwest Colorado, for the benefit of the public today and in perpetuity. Boulder County’s mission is to conserve natural, cultural and agricultural resources and provide public uses that reflect sound resource management and community values. The Natural Areas Department’s mission is to conserve and enhance lands with existing or potential natural area values, lands that serve as community separators, agricultural lands, and lands with scenic values. Conservation of natural habitats and features is the highest priority while providing education and recreation for the Fort Collins community. CCLC is dedicated to the preservation, conservation, and stewardship in perpetuity of the open spaces and natural and scenic resources of the mountain and foothills region of the Clear Creek area. The Colorado Cattlemen’s Agricultural Land Trust protects Colorado’s agricultural land, heritage and families for future generations by conserving working rural landscapes. Colorado Headwaters Land Trust’s mission is to preserve and steward open lands within the headwaters of the Colorado River for vistas, wildlife, agriculture and water, in partnership with landowners and for the benefit of all. CPW’s mission is to perpetuate the wildlife resources of the state, to provide a quality state parks system, and to provide enjoyable and sustainable outdoor recreation opportunities that educate and inspire current and future generations to serve as active stewards of Colorado’s natural resources. Colorado Open Land’s mission is to preserve the significant open lands and diminishing natural heritage of Colorado through private and public partnerships, innovative land conservation techniques and strategic leadership. Continental Divide Land Trust is dedicated to preserving open space in central Colorado through land preservation agreements, stewardship and public education. We protect the natural lands, forests, meadows, rivers, wetlands, wildlife habitat, ranch lands, and rural landscapes that epitomize the beauty of Colorado and contribute to a healthy and sustainable future for our community. 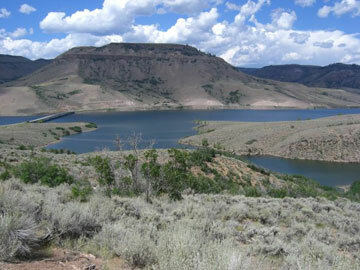 The mission of the Crested Butte Land Trust is to forever protect and steward open lands for vistas, recreation, wildlife, and ranching, thus contributing to the preservation of Gunnison County’s unique heritage and quality of life. The Douglas Land Conservancy is dedicated to the protection and conservation of the natural character, habitat, and open space of the central front range region of Colorado, including Douglas County and surrounding areas. Eagle Valley Land Trust mission is to preserve forever our scenic vistas, open space, historic lands, waterways, and wildlife habitats that represent the uniqueness of Eagle County and the central Rocky Mountains for the enjoyment, education, and benefit of all who experience this special place. El Paso County’s mission statement is to protect scenic view sheds, wildlife habitat, agricultural lands, historic and cultural sites, and to provide recreational opportunities for the public benefit through the protection of prairies, forests, existing ranching operations, and undeveloped natural lands as well as to work cooperatively to develop trail connections and view corridors throughout El Paso County. The mission of Estes Valley Land Trust is to preserve and protect open space, valleys, wetlands, streams, ranch lands and wildlife habitat in the Estes Valley and surrounding area. Jefferson County conserves natural, cultural and agricultural resources and provides public uses that reflect sound resource management and community values. As one of the oldest Land Trusts in SW Colorado, LPOSC has protected over 25,000 acres of land in seven counties including San Juan County New Mexico. LPOSC works with land owners, government agencies, and other entities to protect our working landscapes for agriculture, wildlife, watershed protection, and historical/archeological sites. LPOSC also protects open space for scenic and recreational values. The Land Trust of the Upper Arkansas is committed to establishing a foundation of conservation for our land and water resources while helping bridge the challenges of change through responsible initiatives and education programs for future generations. Our mission is to protect in perpetuity the important natural, agricultural, scenic, historic lands, and the water resources and riparian areas in Lake, Chaffee, Fremont, Saguache and Park Counties. Natural Resources manages Larimer County’s great outdoor places, including open spaces and magnificent water-based recreation areas, and fosters responsible land stewardship through weed management and healthy forest practices. We are committed to fostering a sense of community and appreciation for the natural and agricultural heritage of Larimer County for present and future generations. The mission of Legacy Land Trust is to conserve and protect key natural, scenic and agricultural lands of northern Colorado that make this region a special place to live and work while working in collaboration with local landowners, other non-profit organizations, and other land protection agencies. Lower Arkansas Valley Water Conservancy District participates in water-related projects that will embody thoughtful conservation, responsible growth, and beneficial water usage within the Lower Arkansas Valley, including the acceptance of conservation easements, with or without water. Mesa Land Trust is a private, nonprofit land conservation organization based in Mesa County in Western Colorado. We work to protect the natural heritage, unique character, agriculture and history of the region by working directly with landowners and through collaborations with private and public agencies. Montezuma Land Conservancy exists to permanently protect important open lands in partnership with landowners, in order to conserve agricultural, natural, and scenic open space resources in and around Montezuma and Dolores Counties. We accomplish our mission by working cooperatively with landowners in a non-regulatory manner. Mountain Area Land Trust’s mission is to save scenic vistas, natural areas, wildlife habitats, water resources, working ranches and historic lands for the benefit of the community and as a legacy for future generations. Palmer Land Trust is a nonprofit organization working to preserve important open lands in southeastern Colorado. Our mission is to guarantee that open lands remain a part of southeastern Colorado’s heritage. Our Mission is to acquire, preserve, maintain and manage open space properties for multiple purposes including, but not limited to, recreational, wildlife, agricultural, scenic and access purposes; and to acquire, preserve, develop, maintain and manage trails for similar purposes. Our goals are to protect and support working ranches and farms, water resources, wildlife habitat, scenic landscapes, and inspire a culture of conservation in the San Luis Valley. Since 1996, Roaring Fork Conservancy has inspired people to explore, value, and protect the Roaring Fork Watershed. As one of the largest watershed organizations in Colorado, RFC serves residents and visitors through school and community-based Watershed Education programs and Watershed Action Projects including regional watershed planning, water resource policy initiatives, stream management and restoration. The vision of San Isabel Land Protection Trust is that our region forever remains a beautiful, wild and working landscape with a strong agricultural foundation and a vibrant, healthy community. SMCF’s mission is to be responsive to the special needs of the land and people in San Miguel County and to preserve land on open space and wildlife sanctuary. The Southern Plains Land Trust (SPLT) works to preserve the shortgrass prairie ecosystems of the Southern Plains. We acquire land through purchase and conservation easements and restore it, managing for native flora, fauna, and natural ecosystems. Our mission is to save land for future generations. We work hand-in-hand with community and government leaders, businesses, landowners, conservation nonprofits and other partners to save the places that matter most. The Conservancy in Colorado is working to transform conservation by building on what we do best-on-the-ground results, science and collaboration. We aim to significantly accelerate the pace of conservation to safeguard Colorado’s forests, grasslands, western rangelands and the rivers that weave them together. The Trust for Public Land works nationwide and across Colorado to protect and create the special places that people use to connect to nature and to each other. We have worked in Colorado for nearly 35 years, from the backyards of Front Range cities to the wildlands and working lands of the backcountry. In addition to its park design and development and land conservation work, the organization actively promotes pro-conservation government policies, works to create new sources of public funding for conservation and conducts research into the community benefits of parks and conservation. Yampa Valley Land Trust is a dynamic, results-oriented, community-based, non-profit land conservation organization that works in partnership with willing landowners to secure conservation easements that permanently protect the rural landscapes and important ecological resources found throughout Northwest Colorado. This information is not intended to be legal or financial advice. Please consult your own advisor.